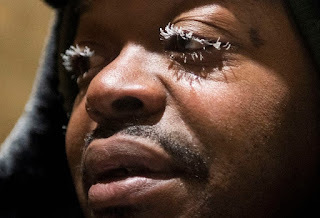 A cold snap -- dutifully dubbed a "polar vortex" by numerous lock-step news media -- has gripped the upper Midwest in this country: Wind chills of -50 Fahrenheit, deaths attributed, schools and airports held in thrall. It's winter. It's cold. In Mexico, the monarch butterfly migration from the north is said to be up 144% over last year. In Mexico, it's warm, winter or no winter. Along the Mediterranean Sea coast where an Israeli power plant exhales warm water into the sea, unlikely sharks have teamed up as an apparent means of sustaining their diets that have been threatened by regional over-fishing. Somewhere, somehow, something is always extreme and I no longer possess the muscle to ward it off. Somewhere, somehow, someone is willing to try to make things better. I just hope they can keep an eye on not making them worse.